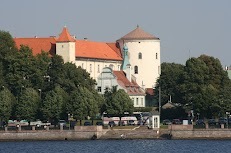 Built for the Order in 1330, Riga Castle served as the seat of the secular power for a long time. The place on the banks of the Daugava was chosen for purpose to oversee all the ship which came into the port, this place was strategically important, as well. A building of this castle was a square with a tower in each corner. Beginning with the second part of the 16th century, when the Order was reformed, the members of Polish, Swedish and Russian secular power had their seat there. The building was rebuilt at the end of the 18th century, the beginning of the 19th century when the third floor was built. The last reconstruction was made in the 30-ties of the 20th century by architect E.Laube, the gate, interior and furniture was designed by A.Cirulis. Now the President of Latvia has his residence in one wing of the castle.